The Danish Prince is visiting Beijing and he gave a speech about Danish bike culture to the students of Tsinghua university. Here is an article about it in China Daily. From the same point I also took a picture towards the North and even there you could see the mountains where parts of the Great Wall of China are. When I was in the Olympic Park I took another picture towards the West. I could even see some fences on the mountains. I love Beijing like this! I hope we will have more blue sky! 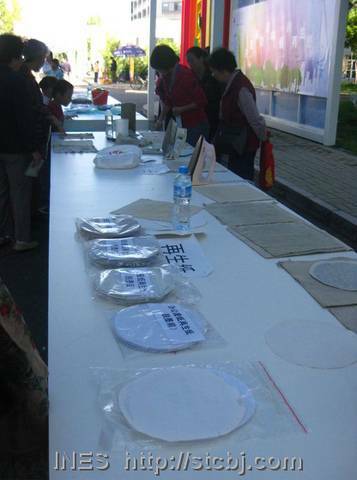 I was heading towards the Chinese Academy of Science for the Popular Science Week exhibition (科普日). 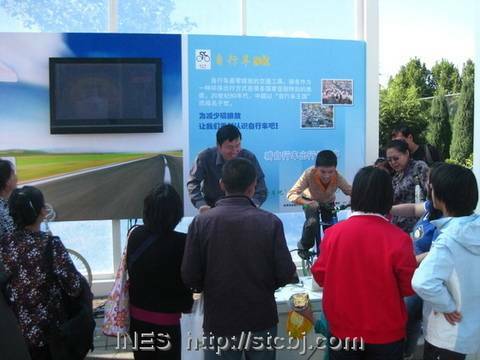 There were exhibits around environmental topics. But they had areas for the people to be interactive. Like for example they had a place where you could rip up a newspaper and then make your own recycled paper out of it. And of course quite some things on wind energy and solar energy. 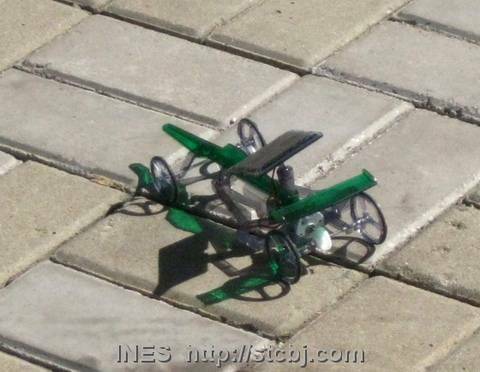 They had little build up yourself model cars that were powered my solar panels. We were involved through our Smarter than Car groups (STC). 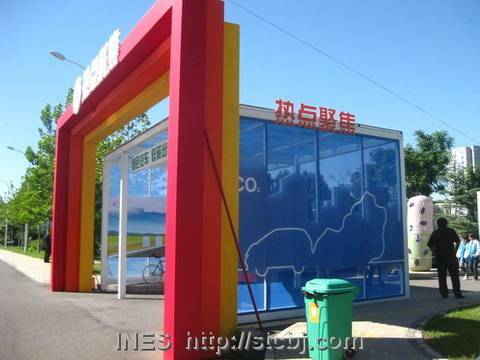 We had worked with the Vehicle Emission Control Center which is a part of the . 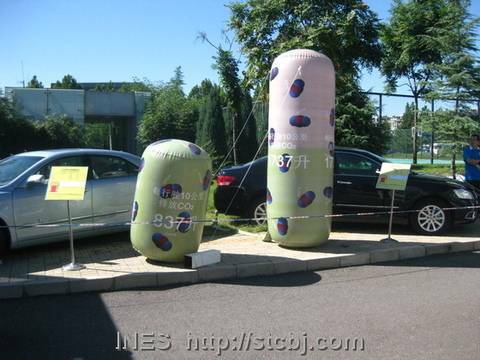 They had exhibits like this comparison of the CO2 emission of a typical nowadays normal car (right side) compared to a hybrid car (left side). 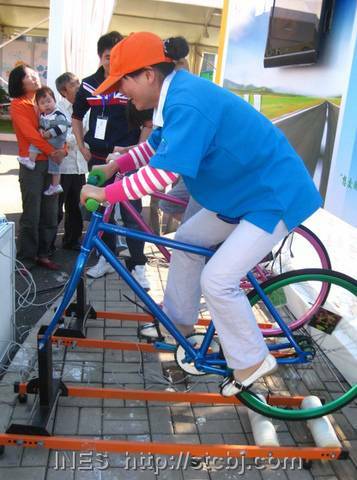 We had provided the JisuPK, the bicycle roller goldsprints as an interactive way to just say biking can be fun. This exhibition had already been on for 4 days. The first day high level officials had been there. 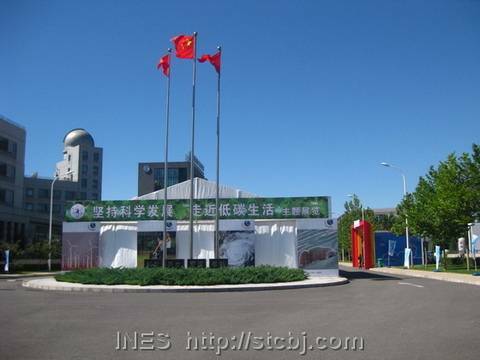 Especially China’s Vice President Xi Jinping, who also came for a visit of this exhibition was interested in our JisuPK bike set-up. But unfortunately that morning the laptop with the software was not there yet so he could not race. 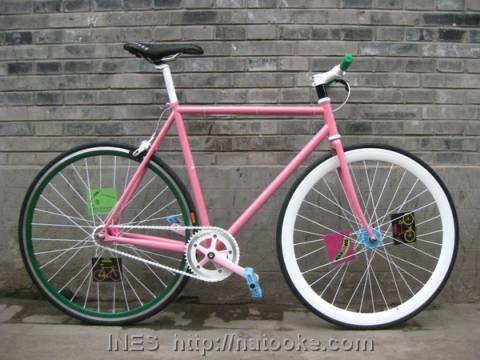 Maybe next time Xi Jinping can challenge someone on our fixed gear bikes. A lot of people every day came to sit on the bikes and pedal as fast as they can for a length of 200 meters. The record for this exhibition until today was 60km/h average speed and that was done by my new employee Dupree. Good work! 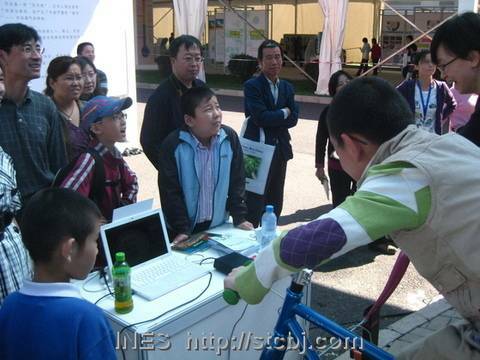 And I also had my bamboo trick bike there and did some performances to show people that the green material bamboo makes bikes which are really stable. 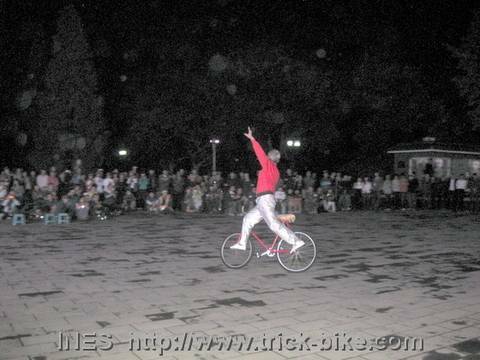 And after each performance the people would just all come close and ask many questions about the bike made out of real bamboo and of course for how many years I have been doing bike tricks. Later I went back to the shop. I forgot that yesterday we did not take a picture of the nice light blue and orange fixed gear bike that a customer had us build up. It was raining the past few days with really heavy rain lat night. Even the whole morning there was still rain and people were getting worried about our event this evening. But in the end it did stop raining around lunch time and Beijing style it magically dried up till the early evening. I love Beijing for that. 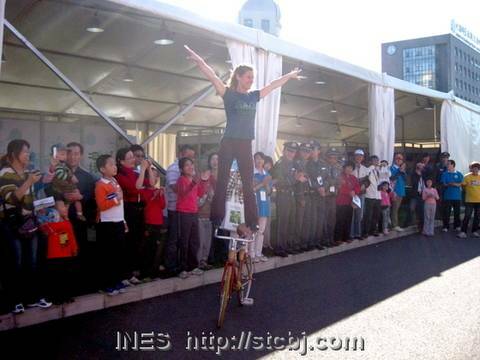 So actually Yu Changqing and I were able to perform at the green bike event for the „World No-Car Day“. First I did some bike tricks and then he did some bike tricks. This is the first time that he is performing in the past 2 years. Unfortunately it was very dark and I had issues to take pictures with my small point and shoot (Why did I lose my nice Canon SLR? In these kind of situations I really want a 5D Mark II). It is getting dark really early these days. I took these pictures at 6:55pm and it was already pitch dark. It seems that winter is coming. Also temperature wise. A few days ago we were still having the fans on in the shop and recently we were talking about the heater. So here is the last picture I took of Yu Changqing’s performance, this time with flash. 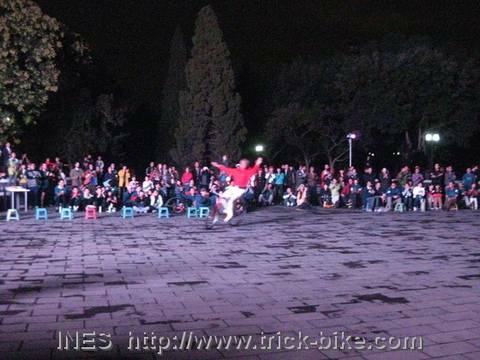 And then for the first time ever Chinese Yu Changqing and German Ines Brunn performed together on a trick bike showing the crowd our love for bikes. 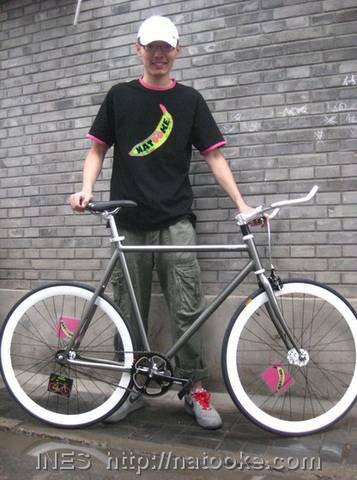 I like this Flying Banana fixed gear bike a lot. And the even better thing is I know the girl! 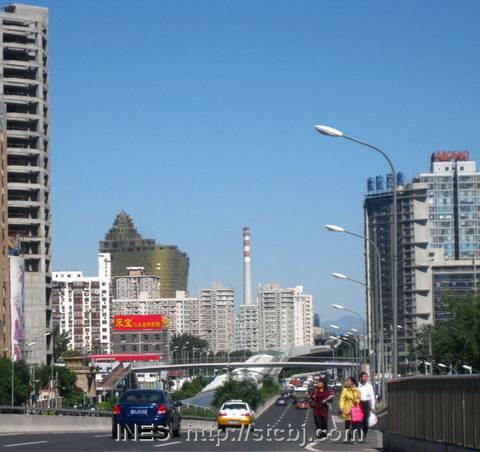 It is amazing how small Beijing is. Happy birthday Martina! 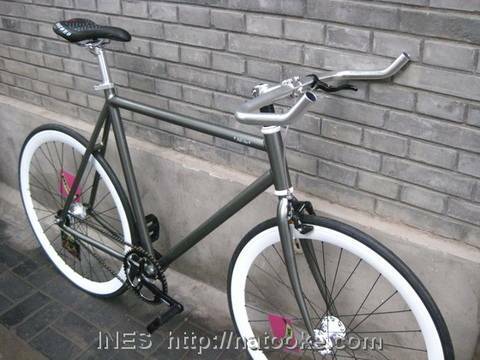 Enjoy your great Natooke bike! In times when you do not feel well it is extremely great to have friends. And I am lucky to have good Chinese friends that care for me. Yesterday 2 of my friends bought me some „hong tang ma jiang“ which is the sesame paste mixed with brown sugar and is said to be good against diarrhea. Today another Chinese friend gave me a huge pot of home cooked „xiao mi zhou“ (millet porridge) and self made „xiang cai“ (salty fermented vegetable) which is also supposed to be good against diarrhea. Eating those actually helped. I had already given up on Immodium which seemed to have not been helping. Currently my diarrhea stopped (I know you all do not want to hear about this). I am so happy that I have Chinese friends! To celebrate ‘World No Car Day’ Friends of Nature together with STC are organizing a ‘bike to movie’ event at Ditan Park. 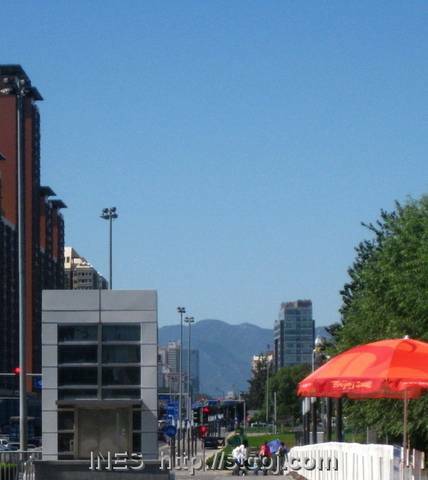 We invite all variety of bike riders to join together and ride to the event to show support for bicycles in Beijing. Come and join us for a classic movie under the stars. The event is free and the first 50 participants from STC (Smarter Than Car) will be treated to a free T-shirt and water bottle. Ines Brunn will also be doing a very very special trick performance together with Yu Changqing. 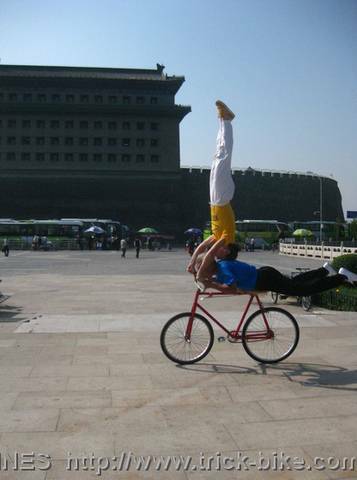 That’s right 2 people on 1 bike doing tricks that most of can’t even manage when standing on solid ground! 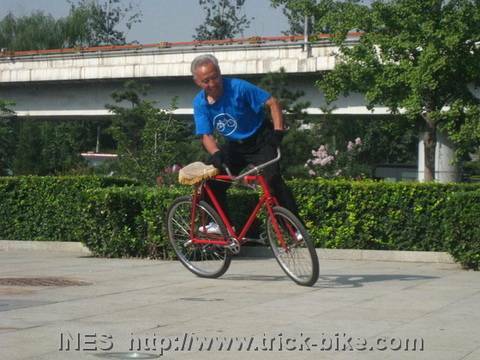 Yu Changqing is a 74 year young Beijinger that started doing tricks on bikes at the age of 13. Over the years he had performed hundreds of times at National festivals and events. After meeting Ines Brunn and watching her perform he was inspired to get back to doing tricks. The 2 are now practicing tricks together on his trick bike. A beautiful mixture of young and old, East and West, male and female bond through their passion for bikes. Due to limitations imposed by the Ditan Park Management the movie screening will begin at 7 pm – therefore STC will organize a group ride after the movie to a bar or club for those that are interested in partying on. 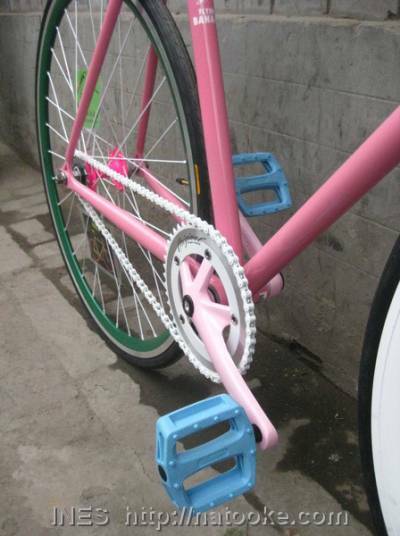 Bring : Your bike and bike lock. Bring friends. Bring some snacks along or eat before the movie ! Natooke shop is glad to have a new employee helping is out in the shop. Thank you Dupree! Dupree and I put a bike together for a customer. 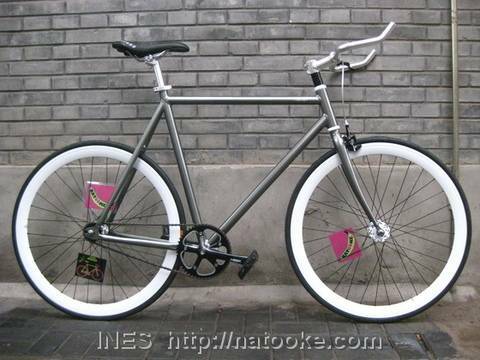 It was an alloy frame fixed gear bike. It has a very classy look with the silver and chrome. Dupree was super happy to have built his first fixed gear bicycle. And he waited for the customer to come to hand it over himself. This evening I was extremely tired as my stomach was not well, but we still went to Jess’s birthday party. It was nice to see friends and have a relaxing evening together despite the continuous rain. 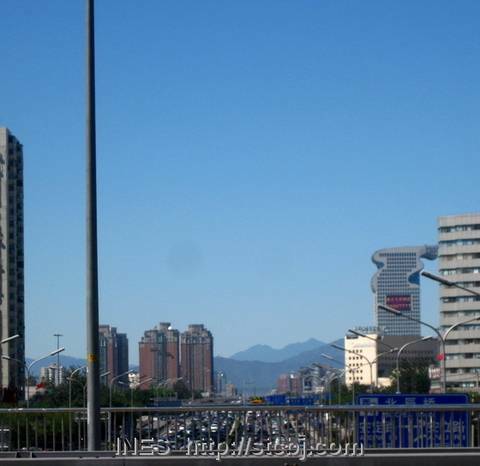 My cycling friend Anthony is heading out to live and work near Dali in South of China. He had won the Alleycat race we had organized for our Fixed Gear Revolution 2 event just a month ago. He came to donate the golden cup trophy to the bike shop. It was the first time for me to see the golden cup in close up: They had actually written „Alleycat Champino“ on it! How funny. Today there was a fixed gear ride that I had organized but I was feeling really sick and had been sleeping the whole day so I had only come to the shop to tell the guys I am not riding. 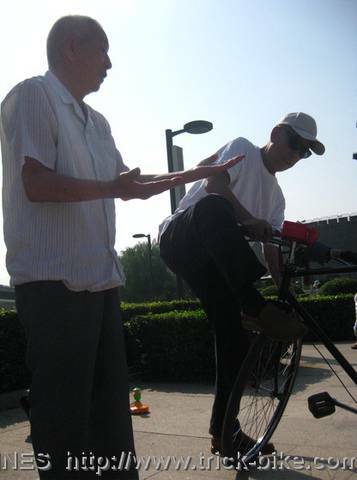 It is fun to meet up with Yu Changqing for our tricks together on one bike. Every time we meet there is someone new coming out of the woodwork. 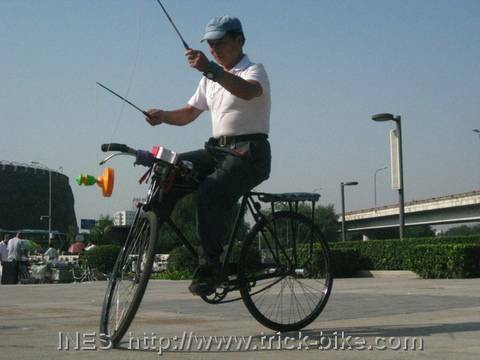 Somebody that played a role in the community of hobby trick cyclists in and around Beijing. 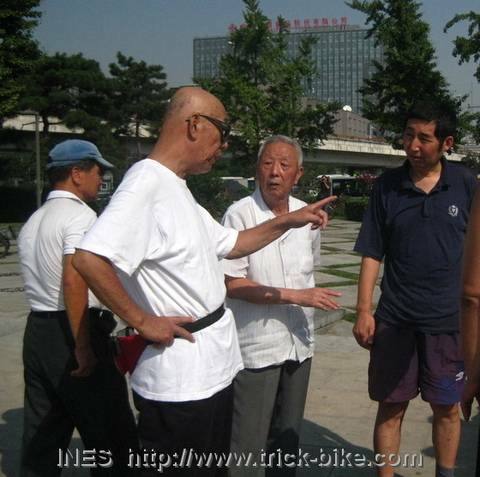 Today we had a guy from Changping that had heard about us training and came to watch. He does juggling on his old flying pigeon for fun. 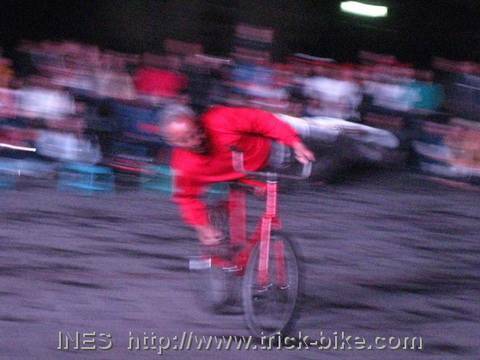 He first showed us the one sided diabolo. Then he showed us the diabolo with a sling around the body. He can also play with the flower stick type of a devil stick. So he showed us that in the same position on his bike. 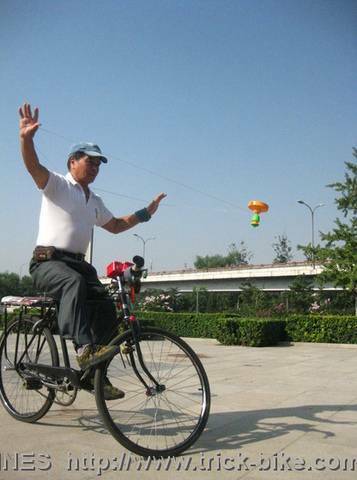 And even with this cyclist from outside of Beijing city of course coach Liang has some suggestions for him. 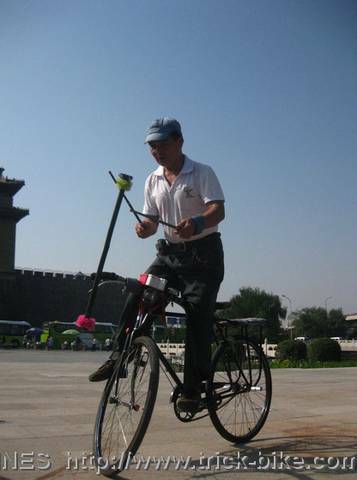 He suggests that it would be better to balance on the front wheel when doing the devil stick. And he shows what he means. 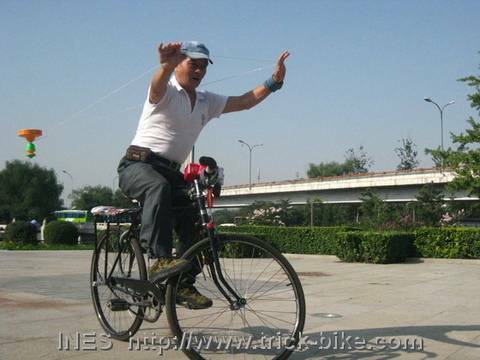 And of course also 80 year old coach Wen has some comments to make on how to best keep balance on the bike and have the hands free to do other things. 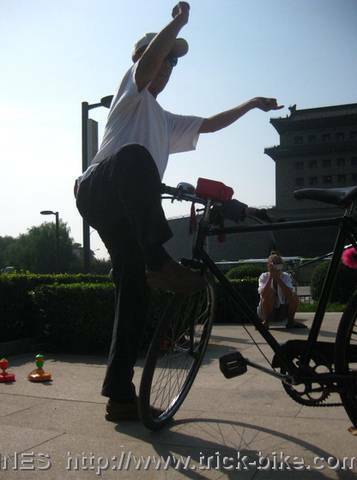 Yu Changqing is very happy to be back on his bike doing tricks. It is great to watch him get more confident every time we meet up. 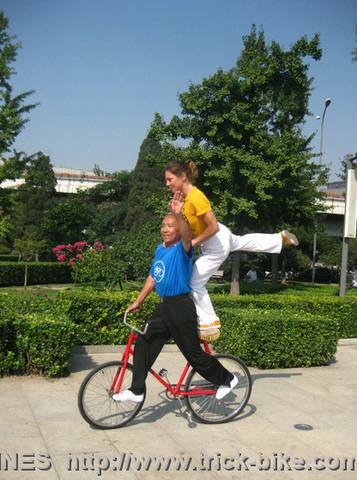 To warm up we do our tricks that are already going smooth like this „lixianghe“. Our „paerduo“ headstand trick is getting better. It is great to have the 2 coaches around that both used to do bike tricks themselves. Coach Wen does not say much but says it in a very precise manner. I really like him as our coach. Of course also coach Liang had some comments to make on my arms. 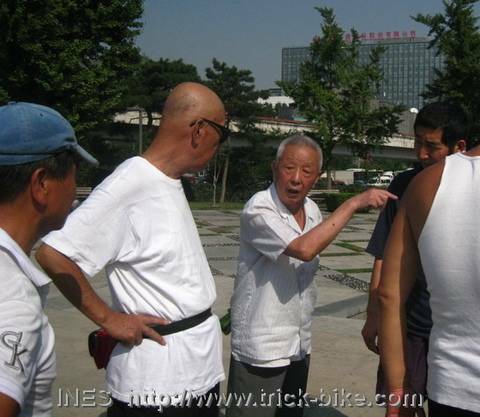 So we tried the trick a few more times on this beautiful sunny day on the backside of Deshengmen and they were happy with the progress I was making. 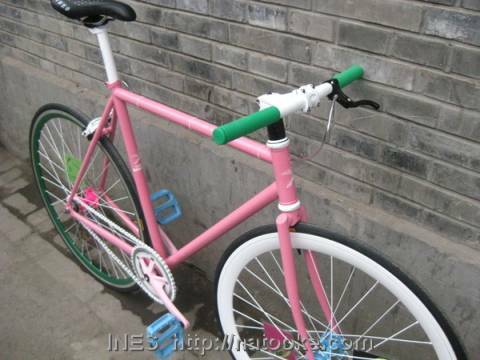 You are currently browsing the China, Asia, Climbing and Fixed Gear Bikes blog archives for September, 2010.